Description: NS 8836 was the middle unit on this westbound trailer train. Description: Westbound on track D coming out of Enola Yard with an ex-Con leading. Description: CSX ES44DC 5316, IHB SD38-2 3861, and NS C40-9 8836 make for a unusual consist as they sit at Proviso Yard. Description: 17M heads northbound at CP-79 on the NS Marion branch. Description: A pair of NS C40-9's heads up 17M at CP-79 on the NS Marion Branch. Description: The headlights of UP Train MNLAS 14 streak past UP Train ASHAS 13 tied down in the siding. Description: Another train departing Norris Yard. Description: Eastbound Coal Train on the connecting track with a trio of Dash 9s. Description: NS Westbound Freight Train 329 passing through 32nd Street Interlocking in Birmingham, Al. Description: Several trains wait to depart Danville yard. 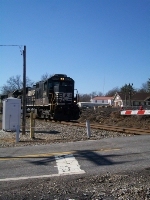 Title: NS 9084 NS Train 920 "Stone Loads"
Description: Rockefellows Mill Rd., 1012 hours. Description: Alot of foreign power. The CSX MP is about to park after bringing a transfer from Moncrief yard. The NS power on the right just brought in a rock train. Description: NS eastbound 223 at moon.